I don't think I will ever get over how perfect Painted Polish micro glitter polishes are. Just when I think I have one of everything Lexi releases something unique. Painted Polish Anchors Away isn't a new release, but this is my first time wearing it. I believe Anchors Away was first released as part of the At Sea: Volume II collection, but I'm not 100% certain as the collection is not on the website. This shade has entirely captured my heart. 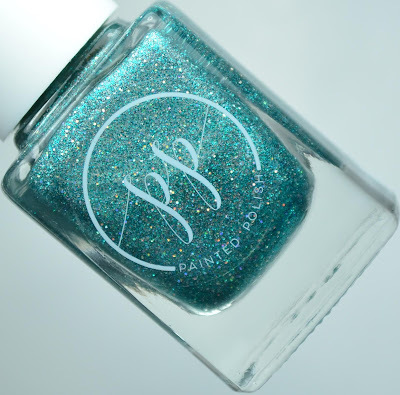 From the teal micro glitter to the holo twinkle, there isn't anything more perfect than this shade right now. Micro glitter can be textured, but I didn't find this to be much of an issue. One medium layer of top coat was enough to do the trick. Notes: Like all other Painted Polish shades I own, this applied flawlessly. Painted Polish Anchors Away is currently available for purchase through their website. It retails for $11+ s&h. If you enjoyed this post you might like Teal Birds featuring Painted Polish and Painted Polish Frisky in Fuchsia with UberChic Stamping.